"I couldn't believe what I had just seen," breathed the Ancestry Insider. The official from FamilySearch had stumbled inadvertently into some slides with maps. In an instant the images were gone. "I looked around and no one else seemed to recognize what had just happened." "We had just seen the New FamilySearch Version 0.9 rollout plan." The Insider quickly scribbled some notes on the nearest piece of paper before his photographic memory got exposed to the cold light of day. When he arrived back at the office, his notes had vanished like Harry Potter underneath an invisibility cloak. Fast forward one year. The Insider received his monthly Baskin Robbin's birthday club postcard, addressed in his own handwriting, for a free scoop of ice cream. (We keep thinking they'll figure out he doesn't have a birthday every month, and its been a long, long time since he was under twelve years of age.) Scribbled across the face of the card were the missing notes. The Insider mumbled something about mailing it to himself on purpose to prove something to the government. As he slipped away from our incredulous stares, he tossed the card back with orders to reconstruct maps and prepare them for publication. "And don't lose my ice cream coupon!" As you read through the plans, remember how old they are. There have been changes. The first phase showed six temple districts on the map: Nauvoo, Reno, Orlando and three others (which we've removed from our map). Notice there has already been one change to the plan: St. Louis was substituted for Nauvoo. Nauvoo may not have been a good choice because it attracts so many attendees from outside the district. 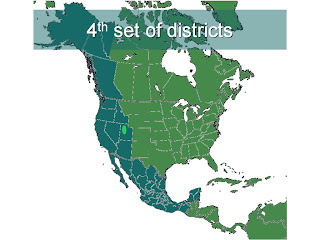 Where are the remaining three districts? 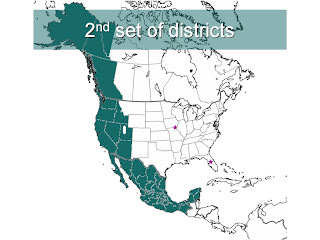 The Insider says to watch for two districts outside of Utah that are easily and inexpensively accessible from Salt Lake City, and one district in Mexico. The Insider says the first set of districts is to identify coding and design problems not encountered in beta testing and get them fixed before starting any large scale rollout. 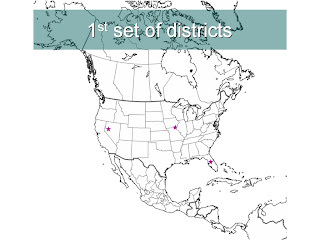 The inclusion of a non-English district detects problems both with language handling and dealing with international issues. The objective of the 2nd phase is to identify any problems with the system's ability to scale up to larger usage and a wide geographic area. The area runs along the Pacific seaboard from Alaska to Mexico, with the notable exception of the populated areas of Utah. Releasing in Utah before scaling issues were identified and fixed would be disastrous. Once all the kinks have been worked out of the scaling and deployment process, the next milestone is the completion of much of North and South America, and the other continents besides Europe. During completion of this milestone ongoing refinements of infrastructure are likely. Plus, the release in each new country brings unique challenges in legal, cultural, technical, and training areas. These take time to resolve. The last milestone completes South America, deploys to Europe, and rolls out to the populated areas of Utah. At least that is the plan. We wonder if the ever eager, infinitely impatient genealogists in Utah will wait so long. Their extended families reach far beyond the state's borders and password sharing may be a great temptation. At one time the Insider heard discussions inside FamilySearch suggesting allowing the state's genealogists to immediately begin cleaning up the many duplications in the family trees that have been pre-loaded into the new FamilySearch. This could provide a better experience to the average Church member. The Insider advises, "don't hold your breath." The new FamilySearch Version 0.9 is being released to members of the Church of Jesus Christ of Latter-day Saints. A later release will allow the general public to use the system. While the Insider has already finagled a fully functional account, and could hardly care when the rest of the world gets to use this exciting, new tool, he is maintaining a rollout status list so you can see how the deployment is progressing. Great Post! Thanks for Sharing. I live in Orlando and I know that the Family History Center Consultants are being trained now for the September rollout. I was doing things earlier today including buying a CD-ROM copy of the syllabus for the BYU Genealogy Conference when I heard it might be only a year from now they get it all rolled out. Might still take the full 18 months from now to complete the job. Depends on how many bugs are found. But I've been hearing a few things that indicate the bug reports have not been as many as feared, but the report I heard today indicates that there will also be 'at least two updates' as well. 'Updates' could be anything from coding updates to the addition of new features not presently known of.